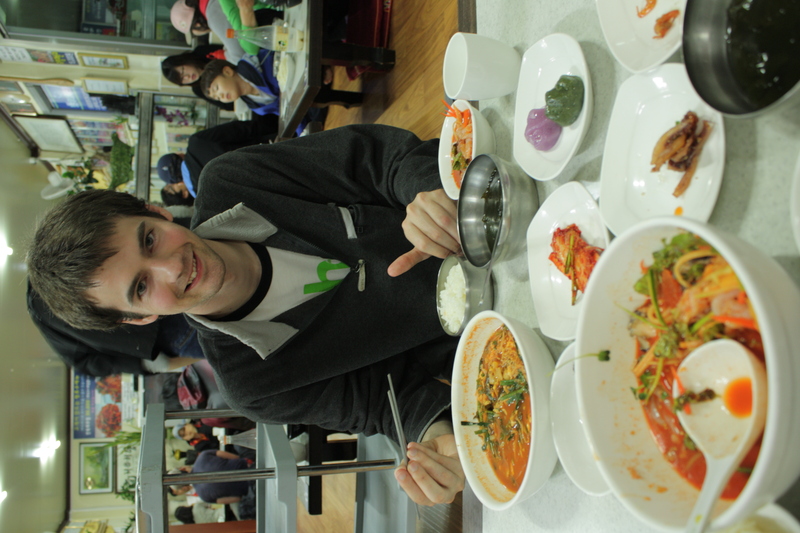 Andrew and I spent the weekend in two beach towns, Sokcho and Gangneung. Sokcho has an impressive fish market where I tried my first squid sundae, which is rice and vegetables stuffed into a squid, diced and coated in an egg batter and fried. Super yummy. The market is really close to the bus terminal so it was our first stop. On Sunday we took a bus to Gangneung, a larger town with an absolutely immense beach. We were wandering around the beach starving when we saw large tanks full of crabs and other delicious live crustaceans and decided to stop in. 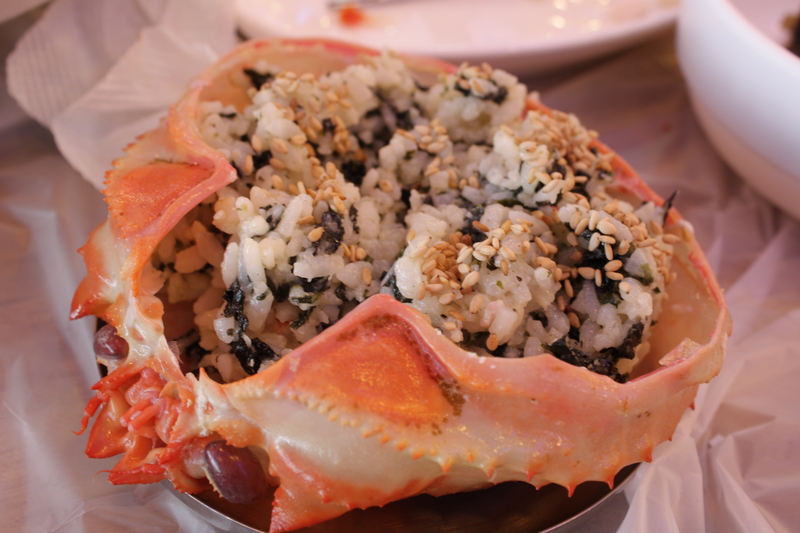 It was definitely the most expensive meal on the trip (about $30/person) but we each got an entire crab, clams, quail’s eggs, and the proprietor took the body of the crabs and made incredibly delicious seaweed fried rice with all the gooey insides. Seriously, it was amazing. 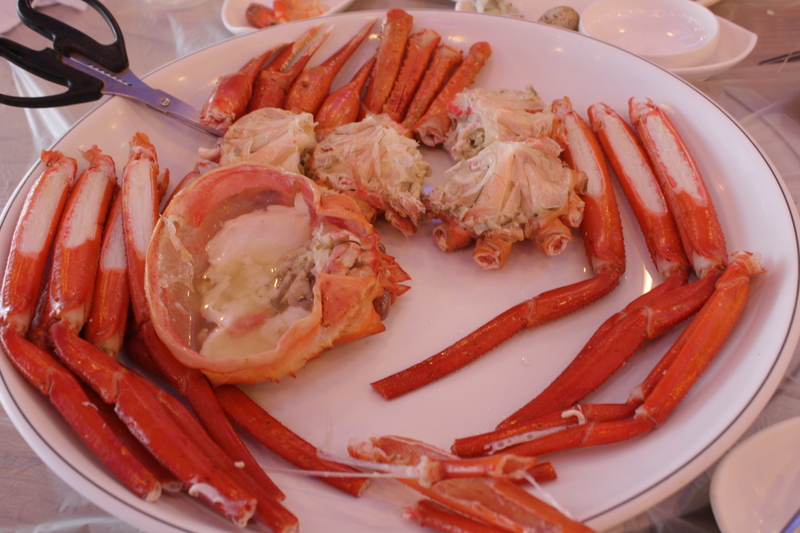 This entry was posted in Asia, Exotic Food, Travel and tagged fish market, seafood, South Korea, sundae. Bookmark the permalink. Aw, Andrew! Loving your photos- glad you’re having a great time and eating loads of interesting food. I now have a great itch to travel!